Take your DSLR camera with you on all of your outdoor travel or wild and crazy adventures. 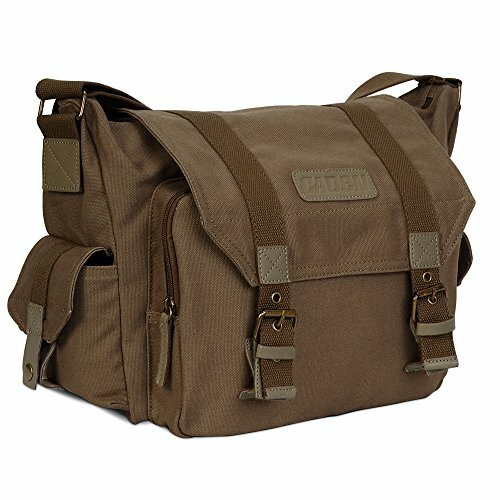 This DSLR camera canvas shoulder bag keeps your camera protected and your accessories handy, so you can capture those extraordinary moments that happen in a split second. It is especially suitable for digital photojournalists, news, and sports photographers. Take out the inner bag, can be also used as a leisure bag. - This Large capacity dslr camera sling bag can hold 1*DSLR+2/3 extra lens +ipad+accessories. - Durable and soft Cotton inner material insert for absorbing shock and vibration to protect your camera against damages, dust and scratches. - High Density Waterproof Canvas with PU Leather Trim, strong stitching, durable zipper, quick snap buckle. - Two adjustable padded dividers are included for interior flexibility and customization. - Compatible with Canon, Nikon, Sony, Olympus, Pentax and other DSLRs and photographic equipment. 【Multi-Functions】①Dual use, it is a professional camera bag and outdoor travel bag;②The width of shoulder strap nearly 2 inches, comfort and decompression. Lengthening design, best for Americian. ③12MM thickness high-density PE foam inner bag, shockproof and drop-resistant.④The capacity of the travel outdoor canvas camera bag can be changed by holes on buckle strap. 【Multi-Functions】⑤Made of waterproof canvas fabric that is soft, comfort, durable and eco-friendly.⑥side zip pocket for 0.5L kettle, umbrella, power bank or charger cable, a front zip pocket can hold iPad, book, mobile phone, card and so on;⑦Convenient storage, the backpack can be folded into the liner box. 【Perfect Design and Good Quality】①All suture parts have taken reinforcement technology, the load-bearing capacity up to 10kg. ②CADeN alloy zipper, smooth and not stuck, won't rusty within 2 years.③2 MM microfiber leather, these fashion elements make CADeN camera bags more fashionable. 【Satisfied Services】3 Years warranty, any problem within 3 years, we will offer a new one for you;20 Years factory experience with more than 1000 employees focused on camera bag and photography gear, trustworthy for you. If you have any questions about this product by CADeN, contact us by completing and submitting the form below. If you are looking for a specif part number, please include it with your message.